Seriously, these are the only things we want to wear, ever. See Finn and Jake — and the Ice King and Flame Princess! — a whole new way, and sport them on your chest. Including a brilliant Star Wars/Adventure Time mashup. GRAND PRIZE WINNER - $2,000 cash "Star Adventure" by Blanca Vidal She says her love of video games, comics and dogs are sometimes a distraction from pursuing a career as an illustrator and designer, but give Blanca Vidal a hand - she pulled off a tremendous grand prize win in our contest with the scifi-referential design "Star Adventure"! Hailing from Lleida (near Barcelona) in Spain, Blanca works in a varied array of styles: from realistic portraits to fantasy concept art. JUDGES PICK - Jessica DiCicco (Voice of Flame Princess) - $400 cash "Adventure!" 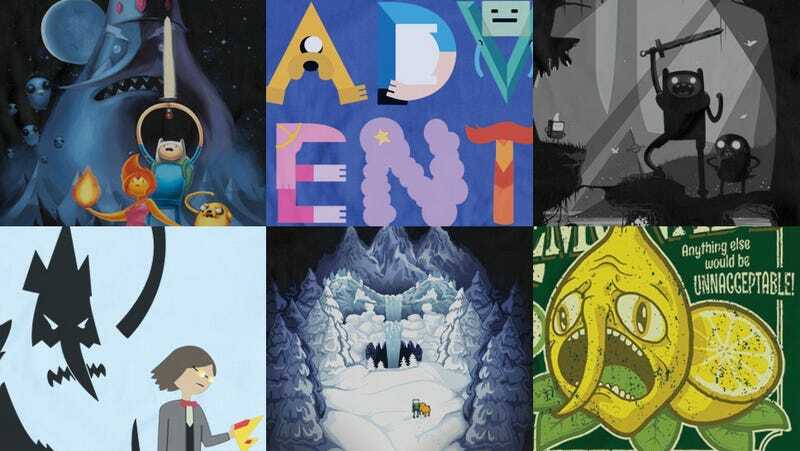 by Sebastian Pren Do you know your ABC's of Adventure Time? Sebastian Pren sure does, and he wove the beloved characters of the show into this fabulous design, chosen by Flame Princess herself, Jessica DiCicco! Sebastian, from Romania, spends lots of his free time working on his art, using various mediums of expression from digital illustration to wall painting. JUDGES PICK - Niki Yang (Voice of BMO & Lady Rainicorn) - $400 cash "Monotone Time" by Philip Meagher It's a spooooky trek through the forest, rendered stark and beautiful in blacks, whites and greys - and it caught the eye of the actress who voices BMO, Niki Yang for her judges' pick! "MonotoneTime" is Philip Meagher's winning entry; the Irish designer also works with a two-man design team called TeeTime! JUDGES PICK - Hot Topic - $500 cash, *Available Exclusively at Hot Topic stores* "Curse of the Crown" by Daniel Brown Everyone's favorite, complicated antagonist of Ooo delivered inspiration for Daniel "Dano" Brown, a California based father of two who wins Hot Topic's judges' pick in the contest! Dano is a collector of old video games, a cartoon fan, and a "die-hard Adventure Time fan" who loves spending timeplaying with his kids. RUNNER-UP - $150 cash "Another Adventure" by Kelly Larson The Ice King was an inspiring figure for Kelly Larson, as well, who takes home a runner-up prize with the beautiful "Another Adventure!" Kelly, a former Betsey Johnson graphic designer, is a stay-at-home mom (of 2 bulldogs) in Minneapolis who love to draw and paint cute and nerdy things. RUNNER-UP - $150 cash "Grab Some Lemonade" by Grant Thackray Are ya thirsty?! Dig Grant Thackray's totally awesome runner-up design, "Grab Some Lemonade"; not to do so would be UNACCEPTABLE! Grant is 20, currently studying digital arts at the University of Oregon, and says his spirit animal is "a dinosaur riding a different dinosaur. I'm not telling you which types of dinosaur, so feel free to imagine the combination that pleases you most." Get them all over at We Love Fine.